Tuber of a plant native to Central America. Despite its name, the sweet potato is not related to the potato. Rather, it belongs to the family Convolvulaceae plants, which produce bell-shaped flowers very beautiful. The sweet potato is often confused with yams, but the latter is actually more starchy and less tasty sweet potato. The aerial part of the plant consists of long stems which may reach 5 meters in length and which produce leaves that are used as spinach. 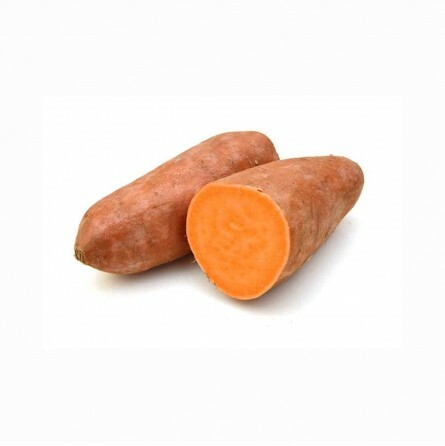 The more than 400 varieties of sweet potato are grouped into two main categories. In the first group, the flesh is firm and dry when cooked becomes almost powdery while the pulp of the second variety becomes, after cooking, soft and moist. Some remains of sweet potatoes were discovered in a cave in Peru and date back to 10,000 / 12,000 years ago and provide evidence that the vegetable has been consumed since prehistoric times. The sweet potato that we know today is thought to be a hybrid of a wild ancestor that originated somewhere in the region between Mexico and the northern part of South America. In the sixteenth century, the sweet potato has migrated to the Philippines due to the Spanish explorers, was introduced in Africa, India, Southeast Asia and Indonesia by the Portuguese. Today the main producers of sweet potatoes include China, Indonesia, Vietnam, Uganda, Japan and India. Sweet potatoes imported in Italy, pasta red or white pasta, arriving from Israel, South Africa, sometimes from Egypt or the USA. This vegetable is a staple food in many Asian countries and Latin America. It is also very popular in the southern United States, where the cultivation began in the sixteenth century. The thin skin of the sweet potato is edible and can be smooth or rough in texture and range in color from white to yellow, orange, red, or purple, the pulp may be white, yellow or orange. The variety in red paste contains a greater quantity of sugars and is preferred for the preparation of desserts. If you can get a beautiful houseplant placing four toothpicks around the tuber in a pot and leaving it in contact with the water until it germinates, when you can transplant it into a pot. It is eaten as a side dish, using it like potatoes, or as a dessert flavor as being similar to the marron glacé. Si prestano per molti piatti gustosi. Magnifiche sia mangiate da sole che come contorno. Hanno un sapore dolce ma non eccessivo. Io le ho bollite e poi impreziosite con della crema di tofu sopra. Ottime, consigliatissime e non si rovinano facilmente. Eccezionali. Fresche e di media dimensione. Ottimi. Prezzi alti per vendita online. Gustosissime fatte al forno, ottima qualità!